Read a few testimonials written by our visitors. They've all bagged freebies and samples in the past, and now it's your turn. Want to leave your testimonial? Scroll to the bottom of the page for the form, fill it out and we'll list it here. Thanks! I love this site and the freebies that you can get can't wait to check the site every day to see what you can get as every one loves a freebie and they are freebies no hidden costs!! BRILLIANT !!! This is my 1st week with Magic Freebies, enjoying all the free offers so far. Look forward to more. I like the freebie site it's great keep up the good work! This site is brilliant, just waiting for my freebies to come, everyone likes to get something free now and again! This is a great site, I check it every day. Absolutely fantastic, love Magic Freebies. The first e-mail I open every day! The range of free offers is amazing. Great site. I check it every day, I love it! I think the Magic Freebies site is good also you can try products before you buy them, best sites I've been on and never well leave. Also like filling in surveys. I love this site and cannot wait for the Magic Freebies to come to my door! Freebies are superb! When You're stuck indoors, it's great to indulge in nice stuff! nail varnish, hot chocolate, lovely new recipes. What more could a girl ask for? I absolutely love the site. Keep the freebies coming. Love the site, the best around, always has something different, brightens up my day. Thank you so much. This is the best site yet! Love, love Magic Freebies. Check it every day and had some great freebies, thanks. I look forward to checking Magic Freebies every day. 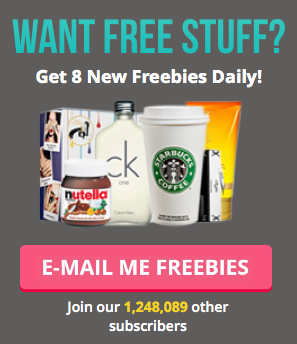 It's a great, easy to use site and I've received loads of free stuff! Thanks. Can't wait to get my freebies! I think this is the best site and I have had some wonderful freebies, thank you so much! I look forward to seeing my postie most mornings. Like Magic Freebies cannot wait till I get my first freebie! Brilliant site lots of freebies not won a prize yet but fingers crossed well done one and all! LOVE magic freebies, FREE THINGS and we all love free things in the mail ,CHECK it everyday❤️. Are you the owner / affiliated with the site?